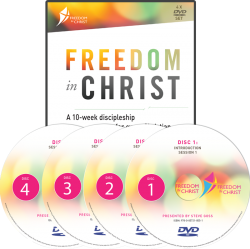 Four disc set of all sessions of the Freedom In Christ Course, presented by Steve Goss, Nancy Maldonado and Daryl Fitzgerald. Includes: All 10 Teaching Sessions of the Freedom In Christ Course Special "Meet the Presenters" film Optional Introductory Session "Why Believe the Bible?" Subtitles in English, Spanish (Spain and Latin American), Portuguese and Latvian.